If anyone's got the market on elegance and sophistication covered, it has to be Chanel. I dream of the day when I'll be able to afford the quilted black leather purse with the chainlink strap and one of the simply fabulous tweed jackets. 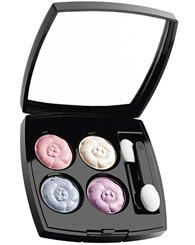 But until that day arrives, I'll settle for the 4 Fleurs de Chanel eyeshadow quad. Part of the new Aurora Blues makeup collection for Spring 2008, this luscious treat includes four gorgeous shadows that are each sculpted into a delicate camellia shape -- which was, what else, Coco's signature flower. Each shade is more beautiful than the next, shimmering and sparkling within the black lacquered case with just the right blend of demure with glam. I for one am totally in love with the blue and lavender hues, and I can't wait to try the cream shade on my eyes during my next winter night out! Methinks it's not only a rose that smells so sweet.